cook. clean. sew. (repeat. ): Which Jane Austen heroine are you? 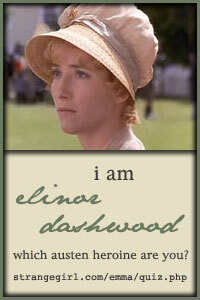 I am Elinor Dashwood as well -- I always liked her! That was fun. I was Elizabeth Bennett. Thanks for sharing.